Women who do not gain enough weight during pregnancy are at increased risk of losing their baby in its first year of life, according to a new study by researchers in the University of Maryland School of Public Health. This study examined the relationship between gestational weight gain, mothers' body mass index (BMI) before and during pregnancy, and infant mortality rates. One-quarter of the more than 159,000 women in the study gained too little weight during pregnancy, and these mothers were more likely to give birth to babies who died in infancy than the women who gained a normal or even excessive amount of weight during pregnancy. The study is published in the American Journal of Public Health and was conducted by Dr. Regina Davis, associate executive director of the American Public Health Association; Dr. Sandra Hofferth, professor; and Dr. Edmond Shenassa, associate professor. All three are affiliated with UMD's Maternal and Child Health Program in the Department of Family Science. Hofferth and Shenassa are also faculty associates of UMD's Maryland Population Research Center. 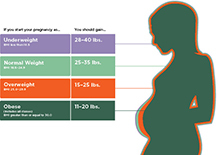 pregnancy weight gain goals that are specific to their individual BMI," added Dr. Hofferth, the study's senior author. weight that was within the recommended guidelines for their body size. Nearly 25 percent of the women in the study gained an inadequate amount of weight, while another 41 percent gained too much. within nine months after their babies' birth, and their information was recorded in the Pregnancy Risk Assessment Monitoring System (PRAMS) for use by future researchers. The study team analyzed the PRAMS data to learn whether mothers' BMI before and during pregnancy might alter the influence of GWG on infant mortality. Infant mortality risks in the study sample were 3.9 percent among infants of mothers who gained an inadequate amount of weight during pregnancy, 1.2 percent among infants of mothers who gained an adequate amount of weight, and .7 percent among mothers who gained more than the recommended amount. Mothers' pre-pregnancy BMI was also a key factor ininfant survival. Mothers who were underweight before pregnancy and gained too little weight during pregnancy had six times the normal rate of infant mortality. Even among overweight women, inadequate weight gain was associated with a two-fold elevation in the risk of mortality. Only children born to obese women were protected from the effects of inadequate weight gain. In contrast, gaining more than the recommended amount of weight was not associated with risk to the infant among mothers in any weight category. Obese mothers who gained an excessive amount of weight actually had a 49 percent reduced likelihood of infant death. This study confirms that only about a third of women in the U.S. gain weight during pregnancy that is within the recommended range. In order to improve the likelihood of healthy outcomes for mothers and infants, healthcare providers should provide childbearing women with gestational weight gain goals that are specific to their individual BMI. Pregnant women can help ensure the health of their infants by monitoring their weight gain, eating an appropriate amount of healthy foods, and engaging in reasonable physical activity.